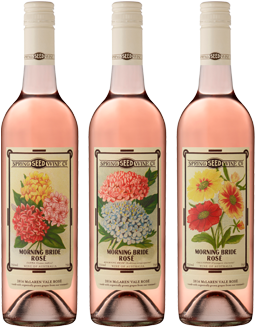 The ‘Morning Bride’ is a dedicated Rosé - we picked some of our Chanticleer Vineyard Shiraz early, especially to make this wine. Grapes were de-stemmed and pressed with no skin contact at all. There was a cool, temperature-controlled fermentation in stainless steel tanks and once the grapes were through malolactic fermentation the wine was stabilised, filtered and then went straight to bottle. Our intention is to make a pale pink dry Rosé reminiscent of the Mourvèdre-based wines from the South of France. Those wines make you think of long lunches sitting on La Canebiere in Marseilles watching the world and his wife go by. I think we have more than achieved our homage to ‘France du Sud’ and in doing so created something uniquely our own –we use Shiraz rather than Mourvèdre. You can smell fresh strawberries, watermelon rind and a hint of ginger on the nose, and fresh red fruits on the palate. Serve chilled as an aperitif or with a variety of foods such as cheese, a crab salad or the traditional caramelised onion tart from the south of France, pissaladière.